Annoying, buzzing flies seem to show up at the least opportune times. Any warm weather outdoor event attracts these creatures, and they hover at the door in the hope of an opportunity to sneak inside. Flies won't go away, no matter how much slapping and flapping takes place. Fly swatters, fly tape, electronic fly traps and the common dish towel – none eliminate these pesky pests. So, what purpose do they have? Well, flies serve many important purposes. True flies, members of the Insecta order Diptera, include more than 110,000 species. These flies pollinate many plants, including the chocolate-producing cacao tree. True flies fill ecological niches as predators, parasites and prey. Some true flies, particularly when in their larval stages, also act as decomposers. Certain members of Diptera, especially house flies and mosquitoes, spread diseases in the process of their normal activities. True flies belong to phylum Arthropoda, class Insecta and order Diptera. The true flies include more than 110,000 species and typically have only one pair of wings and a pair of balancing organs called halteres located at the base of each wing. A few species do not fly but live as parasites or on islands or alpine areas. True fly species range from crane flies to fruit flies, as well as bee mimics like bee flies and hoverflies, and the ever-annoying friendly flies, midges, blow flies and face flies. Perhaps the most famous members of Diptera are house flies and mosquitoes. Despite their reputations as disease-carrying annoyances, true flies fill critical roles in nature. Many true flies serve as pollinators for a variety of plants. Bee flies, hoverflies and other bee-mimicking flies travel from flower to flower. While not as efficient at carrying pollen as true bees, these flies act as pollinators for varieties of plants that bees might not visit. Many of the flowers pollinated by flies do not have nectar to attract bees. The colors of these flowers often range from dull to red to brown and purple. Their flower form may be complicated and their scent often unpleasant, like rotting meat. The flies don't care. Plants pollinated by true flies include wild ginger, red trillium, catnip, paw-paw, skunk cabbage, certain orchids and jack-in-the-pulpit. Without tiny midges to pollinate the cacao tree, the seed pods that produce chocolate wouldn't develop. True flies serve many roles in the food chain as both predators and prey. Flies serve as important food sources for many birds, fish, mammals and other insects. Fishermen study the feeding habits of game fish to select the appropriate fly lures for the time, place and fish they seek. Many fly larvae serve as predators or parasites, like the friendly fly – also known as the flesh fly or sometimes as the government fly – that feeds on forest tent caterpillars or hoverfly maggots that feed on aphids. Fruit flies eat yeast cells that decompose the fruit on the counter. As unappealing as they seem, flies and their larvae are part of nature's cleanup crew. Blow flies, for example, lay their eggs in rotting carcasses. The maggots feed on the decomposing flesh, helping break the organic material into its components. Their digestive processes release the nutrients back into the soil. 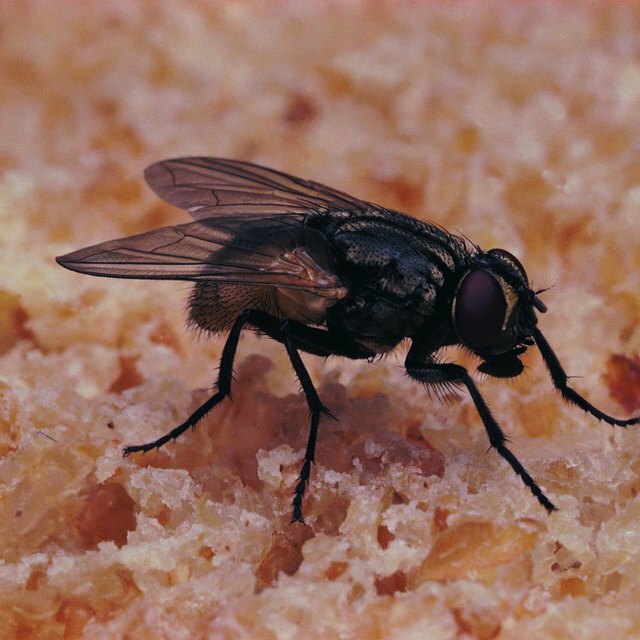 Other flies lay their eggs in manure so their maggots can feed, breaking down the manure. These decomposers complete the food chain, releasing nutrients for plants, bacteria and fungi to use. Some flies carry diseases from place to place. House flies travel 1 to 2 miles without much effort. A fly that walked through a barnyard manure pile easily could walk through a picnic plate later. House flies and mosquitoes rightly earned their reputations as disease carriers, known as vectors. House flies spread diseases including anthrax, dysentery and typhoid fever. Mosquitoes carry diseases such as malaria, yellow fever and Zika virus. Lesser known disease-carrying insects like the Mediterranean fruit fly devastate crops. The spread of disease, however, results as a byproduct of the natural behaviors of the true flies. University of Kentucky: How Far Can House Flies Fly? G, Karen. "The Importance of Flies." Sciencing, https://sciencing.com/importance-flies-10016971.html. 01 May 2018.